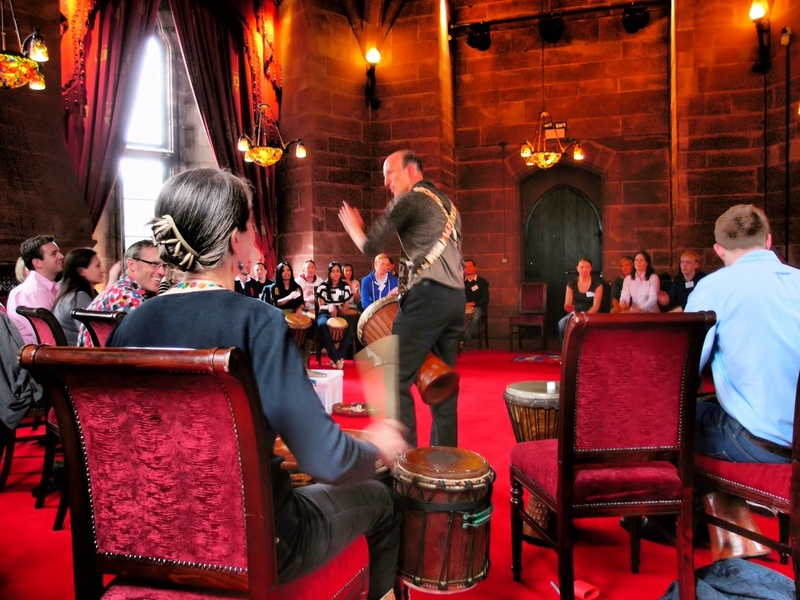 African drumming workshops in Peckforton Castle! We had a great Drumming Team Building session last week at Peckforton Castle in Cheshire. Your Great Escape hired us to energise 65 employees of a law firm who had gone for a training retreat at the castle. Peckforton Castle is a truly magnificent structure. It is a country house built as an exact replica of a medieval castle in 1850 by John Tollemache. It stands in beautiful woodland at the north end of the Peckforton Hills in Cheshire. The place is fantastic! When you arrive you are greeted by the castles residing falcons, hawks, golden eagles and owls nobly perched on the castle lawns. The corridors and steps are all built on a grand majestic scale and the room where the drumming team building session took place was a real wonder. Grand chairs; stained glass windows; a huge heavy door; castle lamps and drapery gave everything that authentic castle feel. Most important of all - a high ceiling created the perfect acoustics for the drumming session! The team were a pleasure to work with. Everyone was open to the activity and this really helped build the momentum for the rhythms. Key personalities created a ripple effect in the group. The group picked up the rhythms quickly but at first many participants seemed to be really concentrating hard - almost as if they were scared of getting it wrong. Someone in the team began to move and dance in their seat to the beats, and this encouraged the rest of group to do the same. Pretty soon the 'ripple effect' had started and 'serious' had turned to 'fun' and 'funky'! The final Boomwhacker session sounded amazing! Many, many thanks Neil Churms (from Your Great Escape) for inviting us to work with such an excellent team!